The overall trend in gross debt of general government among rich countries as percent of their GDP, say from 2000 to 2010, is rising. Only a few have managed to reduce this ratio. The IMF released its World Economic Outlook (WEO) 2011 Report this week. I usually go to the database section immediately to search for my favorite topic then, GDP size based on purchasing power parity (PPP) valuation of country GDP. 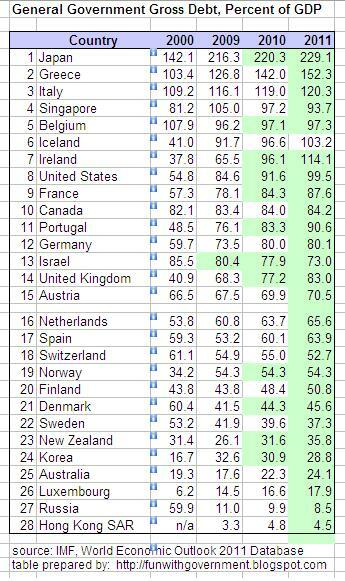 Except for Belgium, Israel, Switzerland, Denmark and Sweden, all of them have rising ratio of debt/GDP. Well, some have very low debt ratio, like Australia, Luxembourg, Russia and Hong Kong. These numbers are generally understated. For one, they do not include debts of their local governments (states, provinces, cities or counties). Two, they do not include contingent debts and liabilities, or debts by local governments and private entities guaranteed by the national or central government. I was also surprised to see the high debt ratio of Singapore, 105 percent of GDP in 2009. But like Japan, the bulk of their public debt is from local sources, from their own citizens and local banks. So there is no immediate foreign exchange risk adjustments in debt payment someday. Easy for so many governments to keep bloating their public debt. The current administrations simply inherit the wastes, inefficiencies, if not robberies and other forms of fiscal irresponsibility, of the past administrations. Thus, their tendency is to get a new round of debts on their own and let the future administrations worry how to pay them later.